The 12th Fleet: Starbase Valhalla • View topic - The Mirror Universe Invades Star Trek Online! 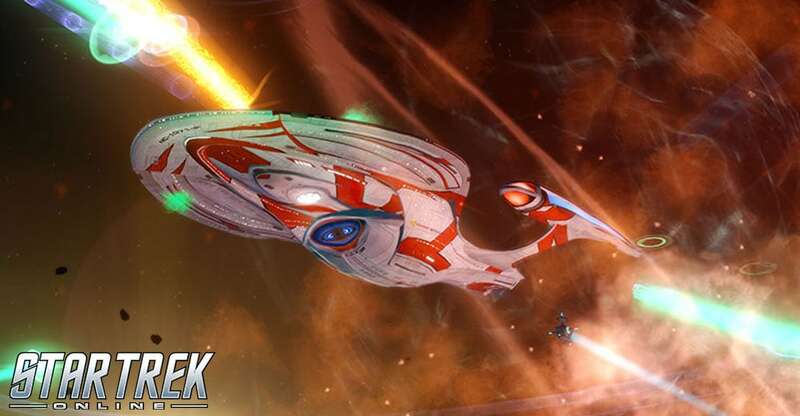 The Mirror Universe Invades Star Trek Online! Post subject: The Mirror Universe Invades Star Trek Online! The Mirror Invasion will be returning to Star Trek Online as part of a brand new limited time event starting on Thursday, November 9th at 8AM PST, and ending on Thursday, November 30 at 10AM PST. This event map will only be playable during this three week event timeframe. In addition to earning a choice of marks for playing the Mirror Invasion queued event, players can run a new reputation project to earn a huge reward of Dilithium, Marks, and a brand new unique ground weapon, Mirror Universe Phaser Dual Pistols! As the event begins, a number of rifts open around the map and ships from the Mirror Universe begin to cross over into ours. If left unchecked, the rifts will grow and launch more powerful ships. You must stop these ships before they can damage the station by either destroying the ships or by closing the rifts. The station is not entirely defenseless, but many of its defenses have been knocked offline in the initial salvos. There are four power substations around the map. Activate them and they will restore power to the station, which will in turn bring station defenses back online. After the initial stage of closing rifts, Vauthil Station emits an anti-tachyon pulse that sends the Mirror Universe ships back to their dimension. However, the Terran Empire launches one final assault, sending one of its special modified dreadnoughts through. These dreadnoughts have the ability to return to the Mirror Universe and will reappear through any open rift in the area. Players can earn marks by closing portals, keeping the station’s health high, leveling up the defenses of the station, and defeating the Mirror Dreadnought within the time limit. The number of marks rewarded varies based on player performance. Once a day, players will be awarded a Multidimensional Transporter for playing this event. By turning in 14 Transporters through the Reputation System, players will receive 50,000 Dilithium Ore, 500 Fleet Marks, 250 Marks of Your Choice and a brand new unique ground weapon, Mirror Universe Phaser Dual Pistols. Completing this project on any character will unlock this new weapon for all characters across your account, and additionally the other characters can still complete the project to receive the Marks and Dilithium Ore.
Post subject: Re: The Mirror Universe Invades Star Trek Online! Hmmm, pistols, not exactly a make my day kind of reward. Ah well, can always use the Dilithium. STO is so dead right now. Yeah, a nice thing about the Mirror Invasion, if you fail to complete it this time, can always use the chits for the next one (or the next one's chits for this one if it is in your queue).